HelpHound Blog: Purplebricks adopts a second reviews solution - why? 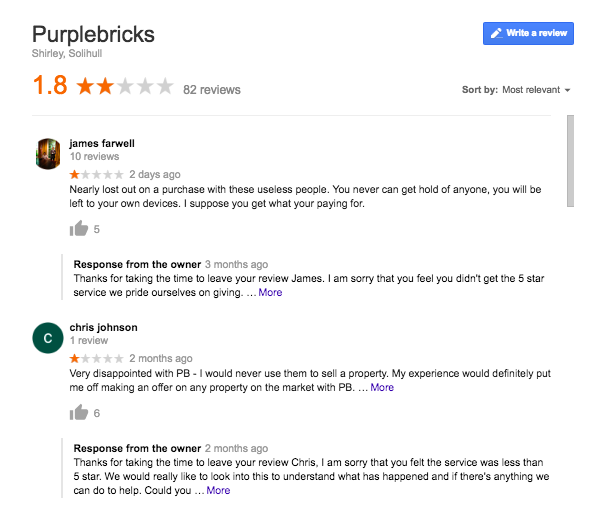 Purplebricks adopts a second reviews solution - why? To attempt to answer this question (feel free to comment, anyone from Purplebricks, Trustpilot or Feefo, or indeed anyone else who thinks they may be able to shed light on this intriguing situation) we will examine the available facts and attempt to draw some conclusions that will be relevant for businesses struggling to decide on the right reviews solution. Why use two reviews sites? Why so many more reviews to Trustpilot than to Feefo? 1. Why use two reviews sites? We can only assume that 'testing' continues. Maybe one day Purplebricks will decide on one or the other, we will monitor the situation. Our comment: As regular readers will know, at HelpHound we believe that systems designed for online retail, where transactions tend to be in the tens or hundreds of pounds at most, are not sophisticated enough for services where hundreds of thousands of pounds are at stake in every transaction. We firmly believe that high-value businesses such as estate agency (and financial services, wealth management, legal and medical services, and so on) owe it to all their stakeholders - especially their customers - to invest in proper professional review management (which, ironically, need not necessarily cost a penny more). 2. Why so many more reviews to Trustpilot? Purplebricks told Property Industry Eye that they have been 'live' with Feefo for some months. According to their listing on Feefo the first review was posted there seven months ago. One might expect some time would be taken to integrate a new system across the business, but the flow has been fairly even since day one. 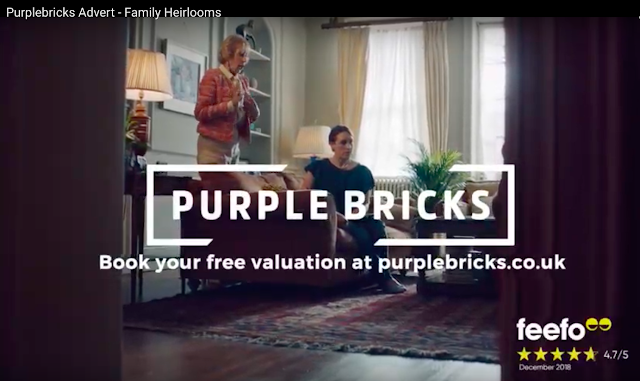 Our comment: it would appear that Purplebricks staff may currently choose which solution to use to invite their customers to post a review. What we do know is that they are still overwhelmingly choosing Trustpilot for this purpose but are referencing Feefo in their marketing. If you were working at Purplebricks, which route would you choose for your 'happiest' customers? No amount of positive reviews on any reviews site will counteract an image like this on Google. Why? Because anyone seeing a business that looks like this on Google - and reading the content of the overwhelmingly negative reviews - is going to bother taking the next step (reading the reviews on the reviews site). It's called 'deflection' - and there's a whole article devoted to it here. But, in essence, it's very simple - your happy customers write reviews to the place you ask them to, your unhappy customers write to Google. And unless your marketing and review management strategy takes that vital point on board then your business will suffer. The CMA regulations exist to ensure that consumers are not misled by businesses manipulating reviews. The full regulations - and our analysis of them - are linked to under 'Further reading' below, but suffice to say that there is a really easy litmus test: ask yourself 'does the reviews solution we have adopted/have under consideration give us any advantages over the consumer - can we challenge, control, delay or otherwise influence the publication of our customer's review?' And that includes having an 'invitation only' system. If the answer is yes - your business is non-compliant.